Last week I was thinking of things to make that would be easy and delicious. 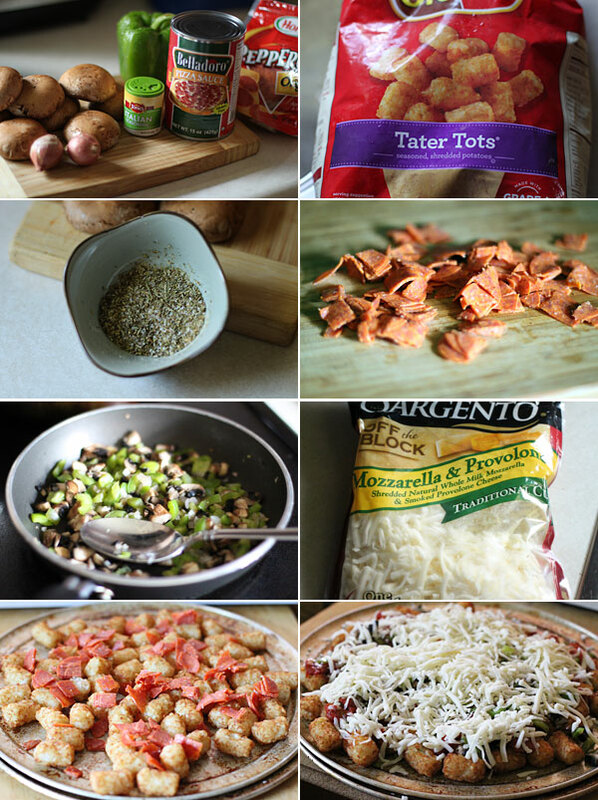 As you probably know, I have been on a pizza making rampage recently, and as I thought of creating a couple of more pizza recipes, I decided that I would take what I love in a pizza, and substitute the dough, well, with tater tots. Why not right? I’ve made pizza nachos in the past, as well as Idaho nachos, so I decided to come up with pizza tots and see how they would go over. Let’s just say they were awesome. Start by baking the tater tots. We will remove them from the oven about 75% into the cooking process. Add the minced garlic to the pizza sauce, and bring to a simmer on the stove. Mix the Italian seasoning, salt, and pepper to a small bowl. Add the green pepper, mushrooms, and shallots to a skillet, and cook for about 5 minutes on medium heat, just to sweat the vegetables. Check the tater tots. As soon as they start to get crispy, remove them from the oven and sprinkle on the Italian seasoning mixture. Shower the tots with the sliced pepperoni, and place back into the oven for about 4 minutes. Remove again, then drizzle over the pizza sauce. Spoon the vegetable mixture over the tots. Top with cheese, and place back into the oven until the cheese just begins to get golden. Serve immediately. The result is everything you want in a great pizza with the unexpected tater tots. You get that great crispy exterior, and soft interior from the tots, that when pulled along with that awesome stringy cheese, and along with the vegetables and spicy pepperoni, well, I’ll say no more. Give these a shot! Check the tator tots. As soon as they start to get crispy, remove them from the oven and sprinkle on the Italian seasoning mixture. Shower the tots with the sliced pepperoni, and place back into the oven for about 4 minutes. Remove again, then drizzle over the pizza sauce. Spoon the vegetable mixture over the tots. Top with cheese, and place back into the oven until the cheese just begins to get golden. Serve immediately. 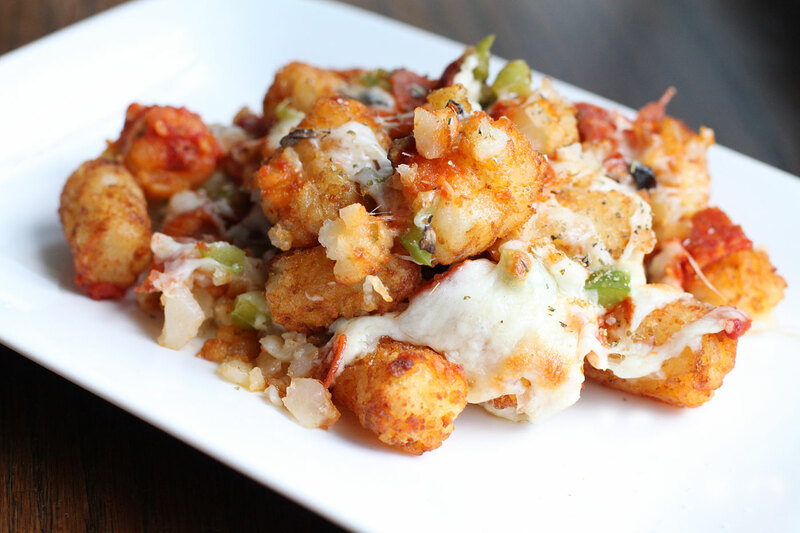 The result is everything you want in a great pizza with the unexpected tator tots. You get that great crispy exterior, and soft interior from the tots, that when pulled along with that awesome stringy cheese, and along with the vegetables and spicy pepperoni, well, I'll say no more. Give these a shot!